Human social nature is a balance of cooperation and competition. Games tend towards competition. There are cooperative games but generally if you're playing a game in a risk free no consequences environment it's actually a really good place to compete with people because you don't lose your job/life/front teeth when things don't work out. I think one of the clearest ways in which this has been shown is the case of the virtual world game. Virtual worlds (MMOs and MUDs) were seen by their pioneers as spaces where both cooperation and competition could thrive in tandem. Ultima Online, Everquest, Star Wars:Galaxies all had mechanics that strongly forced competition. In most of them crafting was so extremely laborious that you couldn't make everything you needed - you were forced to get some items from other people. Auction houses were limited or absent so to get a weapon from a weaponsmith you had to visit that specific player, encouraging social interaction. Both PvE and PvP challenges often forced players to gang up, soloing was somewhat limited. And the difficulty of encounters forced people to discuss tactics to beat them. Players have consistently fought against and lobbied for change on mechanics that prevent them from advancing alone. The modern MMO is a streamlined affair where group encounters don't really reward any conversation or working relationship, where solo advancement paths are very viable and where even on group situations people are encouraged to focus on themselves (eg "I topped the damage meter"). Magic is an extreme of competive gaming, the game is built around redistributing assets from unsuccessful players to successful ones. That's a big part of the fun for me right now, there's a clear and verifiable experience of where you stand. If you're very good you finish with lots of prizes, if you're average you gradually bleed resources away (after all the house always wins) and if you're bad you should probably stop playing and play something else. So right now I'm still in the learning stages but I'm interested in completing my apprenticeship and seeing where I land. If I'm good at this game then it's a never ending stream of more and more prizes, with entry fees being comfortably paid out of my winnings. If I'm not very good then it would be good to know that. MTGO: proceeds of a new account farm. I'm in the groove now of my Magic farming strategy. I've just used the last of my New Player Points on my third account and the practice has made me a much better player - in fact I've now gone 3-0 a couple of times. Not bad for someone who's only been playing just over a week! The tactic is to open an account then play 4 New to Magic Sealed Deck tournaments. Coming in with 2 or 3 wins in one of these tournaments wins 2 tickets and you get 5 free ones with each account. In other words a new account gives 5-13 tickets for $10 plus tax. Tickets otherwise cost about $1 each although there's some fluctuation on the secondary market. On my first account I had a one win and two two win results for 11 tickets. 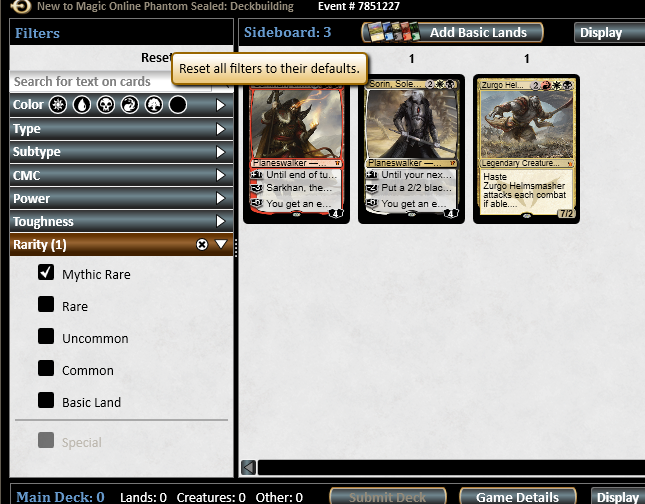 My next account I didn't get any 3-0s but I did manage to get 4 two win results for 13 total tix. My third account I got 2 2-1 results and 2 3-0s for 13 total tix. In addition I got 60 Khans Of Tarkir cards as Sealed Deck prizes (2 rare, 22 uncommon and 36 commons) although asking a buybot for an offer only gave me an offer of 0.17 tix. I clearly didn't get any sought after rares. I had decided I would spend £40 getting back into Magic. That's $60 which is 5 new accounts so I'll do 2 more. I've also since decided since I'm having fun that I'll spend an additional £40 each time a new expansion comes out, including the one at the end of the month, so that's about £160 per year. That's a reasonable budget that over time should see me becoming competitive without again becoming the huge spender I was in my youth. It did occur to me to wonder whether farming noobs is ethical. In the end I decided yes, its fine. First I'm fairly clueless myself. I'm not used to it and am making a lot of mistakes. While I used to play Magic that was years ago and I've only been playing this game, MTGO, for just over a week. Next I think it's fine to farm noobs anyway. Magic is farm or be farmed, that's just how it is. Every Magic player farms other Magic players. You can't give people cards for winning and not expect people to gravitate towards however they get the most wins. Next it seems to be designed deliberately. There's no need to give away tix with new accounts, they could give account bound entry vouchers like Blizzard did in Hearthstone with the free arena entry as part of the Goblins and Gnomes prelaunch. If Wotc, who are pretty smart cookies and very experienced at this business, have set things up so newish players optimally farm very new players it's likely as a way of retaining people at the crucial point of having run out of free stuff and having to think about playing with the big boys and girls. Then again a simpler explanation is simply that Eve has ruined me for online ethics. The next phase is to experiment with Pauper format until I can reliably get about 50% win rate then use my tix to enter events. In Khans of Tarkir, the current Magic expansion, there are 5 clans. One of these, the Mardu, uses Red, White and Black mana. 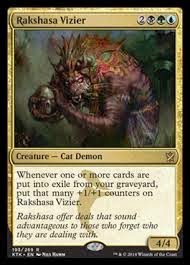 It contains some of the best cards in the game, such as Sarkhan, the Dragonspeaker and Sorin, Solemn Visitor but these are mythic rare. You're unlikely to see a Mythic Rare in your cards, much less a good one. Looks like I'm playing Mardu this time. MTGO: Now this is a play! I got a weird card in my latest Sealed Deck set, one of those cards where there are a lot of rules on it but they don't seem to make a lot of sense. Well whatever, it was a 4/4 which is a solid side of beef so I tossed it into the deck. Subconsciously my mind was nagging away at all that verbiage and then it hit me! Eureka! What the card really means is: gain a +1 counter for each card you Delve. Let me backtrack. Delve is a core mechanic for the current Magic expansion, a way of powering spells using trash in your graveyard instead of valuable mana. I had several really good cards which used Delve. That's a lot of words to say +1 per card delved. Then I cast this, using a card from the graveyard, giving my guy +1/+1 permanently plus +6/+6 temporarily. So instead of trading creatures my 11/11 ate his poor monkey for breakfast. I am now the proud owner of 3 MTGO accounts and am working my way through the free New Player Points that come with each account and allow you to enter special new player events. At least they're called new player events, so far my opponents are divided about 50/50 between people who are genuinely new and veteran players brutally farming them. One opened account costs $12 (in the UK) and gives 5 free tix (equivalent to a dollar each) plus the chance to win 2 tickets from the 4 New to Magic Online Phantom Sealed events your points let you enter. If you get 2 or 3 wins (which roughly corresponds to the top half) you get a pack with a load of very common cards and 2 tix. So potentially you spend $12 and get $13 back if you can place every time. Another way to look at it is the cost to enter limited events. Magic limited events (where they give you a small set of random cards as part of the entrance) are a ton of fun and even the playing field against veteran players with huge card collections and all the strongest cards in their decks. Most Magic players like Limited and are quite prepared to lose value just for the fun of the events. From that perspective $12 buys you 4 Sealed events. It can be a great way to look at the new cards when the next expansion comes out. Magic experts have calculated expected value (EV) of participation in events in great detail, there's even a calculator available. Looking at that you can expect a loss of 1.99 tix every event, or in other words if you count cards as equivalent to money it costs you $2 per event if you have 50% win rate. Except those are averaged expectations, the prizes are skewed towards the most successful. On average it costs $1.99 but that counts the guy who usually wins 4-0 and walks off with 11 boosters whenever he does. An average player, never getting 4-0 but also never getting 0-4, with an even amount of 3-1, 2-2 and 1-3 results will get 6, 3 and 0 boosters for those results respectively, which is 3 on average. The event costs 6 boosters and 2 tix so about an $11 loss per event. Or $11 for 3 hours of fun if you prefer to view it like that. $12 for 12 hours of fun seems a much better deal, or including the prizes and free tix with a new account, about $1 for 12 hours of fun for an average player (I'm assuming playing in the newbie events is worth a free win every time so you'll get 2 wins 3 out of 4 times for 3 wins of 2 tix each, plus the free 5 which is 11 tix per account opened. In other countries sales tax is less so you pay closer to $10. Now is it an error to equate game value to value in actual money? Well according to this article investors have used out of print cards as a method of achieving a return on investment that outperforms the leading mutual funds. People take these cards astonishingly seriously. MTGO: a newbie's thoughts on starting out. Magic is a game designed to tantalise you with the prospect of winning to entice you to spend more money. This is to some extent capped by formats which are reduced card pools allowing players to compete more cheaply because you only need to own the cards in that set, and even there, just the ones you use in your decks. The cheapest format is called Standard Pauper. Pauper means decks built using only Common cards. Standard means decks built using only cards from recent sets. So Standard Pauper means decks built only using Common cards from the most recent sets which is about as cheap as it gets. Another cheap way to play is using the new player system. When a new account is made your starter pack comes with 5 Event Tickets and 20 New Player Points. Event Tickets (tix) players use as the currency of the secondary card market where you will want to trade for the exact cards you need to use your decks and you also use them to enter official events where prizes can be won. (There are also player run events which generally have a low prize value but are great when new to the game). Your New Player Points allow you to enter a variety of events open only to players with these points from opening a new account. The most lucrative of these is the New to Magic Online Phantom Sealed, a scheduled event which is run in several time slots on Fridays, Saturdays and Sundays. In these events you will win a useful prize if you can get 2 or 3 wins from 3 games, so it's about 50/50. Opponents range from newbies who are obviously struggling to work out how to cast a spell (one poor chap pulled out a powerful creature destruction spell against me - but then proceeded to cast it on his own creature!) to obvious veterans who are brutally farming the noobs for easy tix. Competitive Magic is very rewarding if you can be a big fish in a small pond. In this case if you can average 2.5 wins from the 4 events you have made as many tix as you would have done buying tix directly from the WotC store (10 tickets for your ten bucks new player fee). I've played 3 of these and have gone 2-1, 2-1 and 1-2. I lost a crucial match by running out of time so once I know the game a bit better hopefully I can consistently get 2-1s or better here. The downside of farming these events is that it costs $10 plus tax to enter (that comes to $12 in the UK) and you are generating in-game assets so unless your budget is completely open you will have to move on after a while. My initial budget for MTGO is about £40 so I'll do this 4 times then assess. 4 times with 4 events per go and 3 matches per event is a lot, potentially 144 hours of playing time. Even without the prizes it's pretty cheap entertainment. There are also Player Run Events which generally have threads on the WotC official forums and have postings on a very impressive Event manager website run by fans called Gatherling. Another useful site for events and news is the Pauper site, PDCMagic.com. These events are great for new players as they're free to enter. The players are pretty competent though, be prepared to get destroyed a lot while learning! I've played one tournament so far. I actually beat my first opponent but then got trounced firmly. I did get given a few spare cards though by kind players. So after you've farmed noobs a bit until you've hit your budget and have mentally allocated a night or two a week to regular tournaments what comes next? The next goal is to start farming and being farmed in Constructed competition. To do this you will need a deck. Decent decks generally have two elements in common - someone else will have figured the deck out and you just steal the idea from the internet and the cards are more expensive than is typical for the format. For instance in pauper a very popular spell that hasn't released for years might be as much as $20. You can get deck ideas and valuations from sites like mtgo-stats. Currently the cheapest deck that's done well in a Pauper tournament is $7.02, so you don't need to break the bank to have a competitive deck. It might seem tempting to get a lot of cards that seem good and try to figure out your own strategies. This is certainly a very healthy element of Magic but from an efficiency point of view now is not the time. You're at the bottom of a huge learning cliff. Your notion that a certain combo might be good has almost certainly already been thought of and tried by other people and guess what? no one's winning tournaments with that deck. There's also a huge financial difference between copying a cheapish deck off the winner's list at MTGO-stats and aspiring to collect all useful cards so you can build and test every deck type and all their variants. At this stage it's important to manage your learning and your development. Your free resources are basically practice games in the Just For Fun room, weekly sponsored player tournaments (PREs) where you may sometimes win prizes and your event ticket budget. Each competitive pauper match costs 2 tickets to enter and pays nothing if you lose, 1 booster (currently worth 2.45 tix from the trade bots) if you win. The amount the bots pay for boosters varies. It's currently low because the Holiday event does not take this type of booster as entry free and so demand is low but will pick back up after the event closes. With the current depressed value of prizes you would need a 61% win rate to break even (to win boosters worth as many tix as it costs you to enter events, also called "going infinite"). The going infinite win rate goes down if the value of the boosters is higher but there's a ceiling - the store sells them at $3.99. $4 is break even, a competitive match costs 2 tix (worth $1) per player and awards 1 booster to the winner so if a booster is $4 then a 50% win rate is break even. The swings and fluctuations of the Magic secondary market are fascinating and another huge learning cliff in and of itself. In fact there are players who barely actually play the game itself, just play the market, much like auctionhouse players in WoW. - establish goals and resources. It's very important to set a budget in Magic otherwise it becomes a money pit. - invest your real world cash into multiple accounts farming newbies in the Sealed Deck events in order to win bonus tickets. 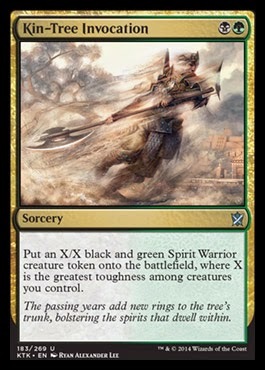 The cards you win are a nice bonus as is the extensive experience of playing in this Limited format. (Normally Sealed deck events are a really expensive way to play Magic). - research and plan for participation in regular tournaments. I'm interested in Pauper and Standard Pauper for now. It's a mistake to play too many different formats as you need to learn a lot to even be competent at one. - invest some tix in a competitive deck that you stole from mtgo-stats. If you like deckbuilding you can do some if you like but you won't really know what you're doing so make sure it's just pauper decks or standard pauper using cheap commons. - practice practice practice with your deck. - spend the rest of your tix entering Constructed pauper 1v1 matches and keep track of your win rate. If you can get over 50% consistently you may want to enter the Pauper Dailies. These events pay out more prizes per ticket but you get zilch unless you can manage 3 or 4 wins from 4 games. If you have over 50% win rates in Constructed that should be possible but it's astronomically unikely if you're under 50%. - at this point you need to keep playing and praticing and getting better. It's quite important to not get distracted by other ways to play like Standard where you can use rares or sealed deck where you get to open boosters. I mean do it if you find it fun and want to spend the money but it has no place in an efficient cheapskate approach. - this point may be a good time to buy and test other decks. You may find there's a deck that works better for you than the one you've been using so far. - the pauper meta is almost immune to the release of new sets. Occasionally a card will come in that's worth including (notably Treasure Cruise in the last release), but generally the strong cards all got released years ago and WotC is careful not to introduce more powerful cards in new content. - the profitability of playing pauper will fluctuate wildly. When a new set is released there's going to be a rush of interest and booster price will be close to $4.00. This means you can make a very good return on playing if you have over 50% win rate. In fact in the longer term leaving Magic for a while then coming back to farm when there's a new release is probably a pretty decent strategy. Sell your boosters quick as you win them. If you become very good at pauper you can use your baseline profitmaking ability to get further into the hobby. Farm tix and use them to buy obscure commons for deck tech or use them to buy a netdecked Standard deck and then you can start over learning a new meta. - it's never economic to play Limited unless you're astoundingly good. If you like Limited the most efficient method economically is simply to open more accounts for the newbie events. - if you're really good at Pauper the game insidiously lures you into deeper waters. Some pauper events give you QPs (qualification points). These allow you free entry into advanced tournaments. These tournaments don't use Pauper format. So you have the choice, do I waste my points or do I need to learn the advanced formats and compete there. At this point the notion that you could become a seriously good player, going professional and earning thousands in tournaments all over the world starts to seep in. It's all nonsense except for 0.0001% but it's very very cleverly marketed. Magic has over 12 million players, earns its owners $400 million per year and has never had a year in which it didn't grow. Most astonishingly perhaps the average player age is 9 years. Even Eve Online probably has an average player age around 2 years and games like Swtor may measure such things in months. I digress. I think I've given enough to allow people to participate cheaply without getting sucked in to spending hundreds of dollars. If you do give it a try add me, I'm Callduron1, and read this New Player Guide.